Church Strengthening Ministry invites you and your worship/music ministry team to attend our Church Ministry Summit with the theme, TRUE WORSHIP: Developing a Generation of Worship Leaders. 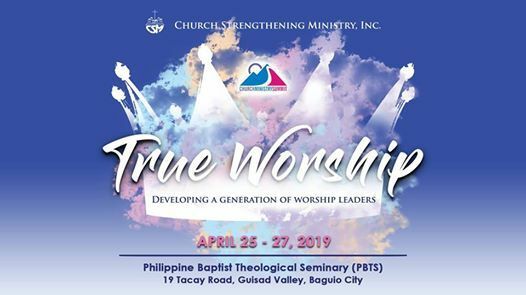 It will be held on April 25-27, 2019 (Thursday to Saturday) at the Philippine Baptist Theological Seminary (PBTS) in Baguio City. Ptr. 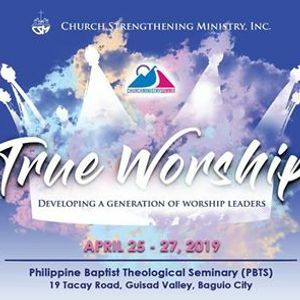 Rommel Guevara and The Worship Project as well as Dr. Armand Canoy, PBTS President, and professors from PBTS will serve as our speakers and trainers.